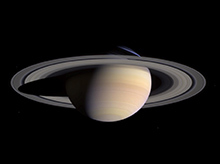 Japan’s Kobe University doctoral candidate Hyodo Ryuki and Prof. Ohtsuki Keiji have revealed that Saturn’s F ring and its shepherd satellites are natural outcome of the final stage of formation of Saturn’s satellite system, in a breakthrough in astrophysics. Apart from Saturn, Jupiter, Uranus and Neptune too have rings, but Saturn’s rings are the biggest and brightest. Found by astronomer Galileo in 1610, Saturn’s rings remained mysterious until 1979 when NASA’s Pioneer II discovered the F ring located just outside the main ring system and two shepherd satellites called Prometheus and Pandora, which orbit inside and outside the ring, respectively. Although the Voyager and Cassini spacecraft later made detailed observations of the F ring and its shepherd satellites, their origin remained mystery till now and the Japanese scientists have revealed the origin breaking the code finally. In their simulations using the computer systems at the National Astronomical Observatory of Japan, HYODO and OHTSUKI revealed that the F ring and its shepherd satellites formed as these small satellites with a dense core collided and partially disintegrated. It means the system of the F ring and its shepherd satellites is a natural outcome of the formation process of Saturn’s ring-satellite system and it explains similar rings and shepherd satellites of Uranus, Jupiter and Neptuen which are similar to those of Saturn. 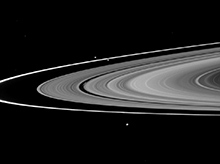 (Left) Saturn’s main rings (NASA/PIA06077). (Center) The narrow F ring located just outside of the outer edge of the main rings. Two satellites sandwiching the F ring slightly above and to the left of the center of the image are the shepherd satellites Prometheus (inner orbit) and Pandora (outer orbit) (NASA/PIA12717). (Right) Closer image of the F ring and its shepherd satellites Prometheus (inner orbit) and Pandora (outer orbit) (NASA/PIA07712). In the center and right images, Saturn is beyond the images towards the right. 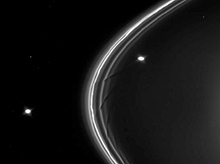 Side view of Saturn’s ring-satellite system. (Top) Saturn’s rings used to be more massive than they are today, and they spread outwards due to collisions and gravitational interactions between particles. 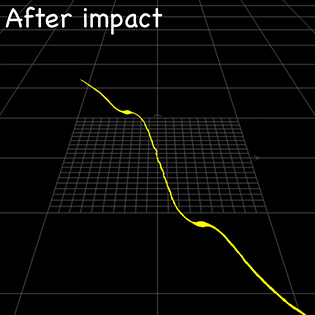 (Bottom) When particles move sufficiently outward, they merge into satellites due to mutual gravity. 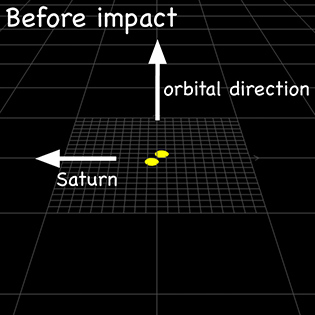 These satellites then move farther away from Saturn. Consequently, the satellites that formed earlier when the rings were more massive are larger and located farther out, whereas multiple small satellites tend to form just outside of the main rings at the final stage of the satellite system formation. In this simulation, two satellites with dense cores collide at the current location of the F ring. 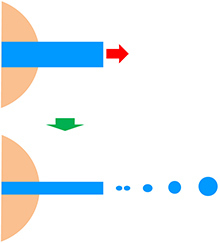 The collision does not destroy the cores, which become two shepherd satellites, and the dispersed particles distributed in between the two satellites form the F ring. Their finding has been published online in Nature Geoscience on August 17.